ORLANDO, FL – Marc Leishman holed a 50-foot eagle putt on the 16th hole to take the lead Sunday, and he stayed there with two tough pars at the end to win the Arnold Palmer Invitational and earn a trip to the Masters. In a final hour that featured four players having at least a share of the lead, Leishman is the only one who didn’t blink. His final act was a pitch-and-run from 45 yards away on the closing hole at Bay Hill that ran out to 3 feet. He calmly made the par putt for a 3-under 69 and one-shot victory over Kevin Kisner and Charley Hoffman. Canadian Adam Hadwin, fresh off his first PGA victory at the Valspar Championship last weekend, finished in sixth place, three shots back of Leishman. The only thing missing was a handshake from the King. This was the first Arnold Palmer Invitational since the September death of the beloved tournament host. Rory McIlroy had as good a chance as anyone, storming into a share of the lead by hooking a wedge around a tree, over the water and over the green on the 16th, then nearly holing the eagle chip. He had a 30-foot birdie putt to tie for the lead on the 18th, and after seeing that Leishman had made eagle on the 16th, gave it a good run. The putt went 8 feet by and three-putt for a 69 to finish two shots back. Kisner and Hoffman also squandered away their chances. Kisner had a three-shot lead at the turn, but failed to made another birdie the rest of the way. His lead began slipping away when Kisner missed the green on the par-5 12th with a sand wedge, pitched over the other side of the green and took bogey. He closed with a 73. “I had it right there in the palm of my hand to win, and I didn’t get it done,” Kisner said. Hoffman rallied from a 39 on the front nine to catch Kisner for the lead, only to three-putt for par on the 16th and then drop another shot from the bunker on the 17th. He made birdie on the 18th that gave him a tie for second. “Proud of fighting back and making a birdie on the last to finish second, but obviously not what I wanted,” Hoffman said. The timing was ideal for Leishman, beyond what he described as an honour to win at Bay Hill in the first tournament without Palmer. Instead of a blue blazer, the winner this year received a red cardigan sweater that Palmer favoured. And instead of seeing Palmer, Leishman at least was able to share it with his family. His two sons, ages 5 and 3, ran out to the 18th green when he finished, and his wife was off to the side. Audrey Leishman nearly died two years ago when she suffered from toxic shock syndrome, causing Leishman to hastily leave the Masters. He was No. 62 in the world and had only two weeks left to secure a spot in Augusta National. The victory takes care of that. 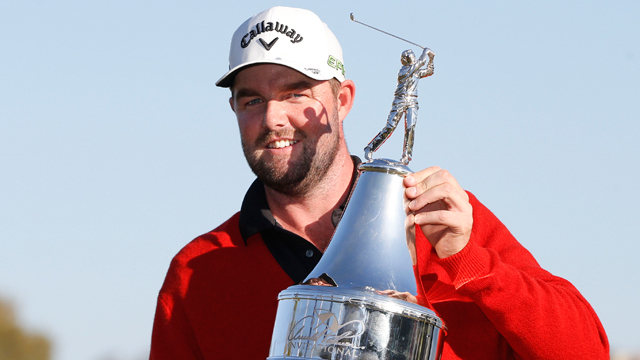 Leishman finished at 11-under 277 and earned a three-year exemption on the PGA Tour. For everyone else, it was a matter of falling apart. Kisner was at 12 under and it good position to add to his lead on the par-5 12th when he pulled his wedge, then sent it across the green and had to scramble. That brought Hoffman, Leishman and McIlroy back into the tournament, and Kisner lost the lead when he took three putts from short of the 14th green. Kisner birdie chip from the 15th green hit the flag. His approach to the par-5 16th from a fairway bunker turned away to the right and rolled out behind a bunker, leaving him no reasonable shot at getting up-and-down. His flop shot came up short and into the bunker, and he had to scramble for par. Needing birdie to force a playoff on the 18th, he missed the fairway and the green to the left. Tyrrell Hatton of England shot 71 to tie for fourth with McIlroy.